From the reports of the German meteorologists German Supreme Command believed that southerly winds (that is, the wind blowing from the south to the north) were predominant in Flanders in the spring. With this in mind, it was necessary to make the attack from a part of the German front line which faced north, so that the southerly wind would carry the gas forward to the Allied trenches. 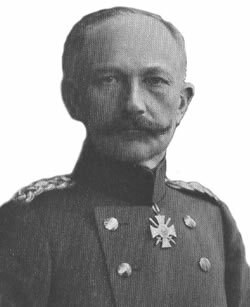 The sector selected by General Falkenhayn for the first trial of an infantry attack preceded by gas was that of XV. Army Corps in the front line of the German 4th Army in Belgian Flanders. This Corps was holding the line south of and including the village of Gheluvelt. It was one of the few stretches of the German front line on the Western Front which did face to the north/north-west. The XV. Corps sector stretched from the Ypres-Comines canal on the left flank to north of the Ypres-Menin Road. 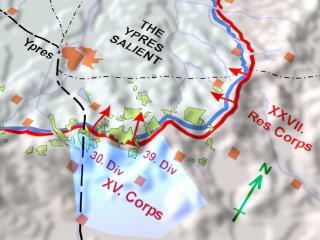 The ridge of high ground, along which the German line had advantageously been established in the south-eastern part of the Ypres Salient, is shown on the map as the 50 metre above sea level contour line. It runs from the border with France in the south-west to the village of Passchendael north-east. On 25th January 1915 the commander of XV. Corps, General von Deimling, attended a meeting at the German Supreme Command Headquarters for the Western Front in Mézieres, France. There he met with General von Falkenhayn and the Chief of Staff of the German 4th Army, Major-General Ilse. Learning that his sector had been selected to test the new weapon, General Deimling requested large quantities of ammunition from German Supreme Command. His hope was that if the gas was successful in knocking out the enemy troops he might be able to exploit a successful breakthrough of the Allied line here. However, General Falkenhayn refused the request on the pretext that this was only a trial to test the use of gas. Should there be a successful breakthrough, however, he said that the necessary ammunition would be sent to the XV. Corps as required. The trial gas attack at XV. Corps was to be organised in co-operation with the neighbouring XXVII. Reserve Corps on its right. The XXVII. Reserve Corps was to mount a limited, localised attack westwards towards the line Zonnebeke-Gravenstafel. The objective was to improve its own position on the ridge of high ground overlooking the Allied positions in the Ypres Salient. General Deimling, Commander of the XV. Corps in the Ypres Salient. The technical direction of the trial gas operation came from Professor Dr. Haber of the ‘Geheimnis Regierungsrat’ (Secret Privy Council). He had been put in charge of the chemical department of the Prussian War Ministry. Oberst [Colonel] Peterson was put in charge of training up special pioneer units to form Pioneer-Regiment 35 to install and operate the gas cylinders. Each pioneer unit included a meteorologist in the technical team of engineers and scientists. The Pioneer-Regiment became known as Gasregiment Peterson. It consisted of two battalions, each having 3 companies. The regiment also had attached troops in a Park-Kompagnie (a depot/stores company), a Feldwetterstation (a meterological station) and a Fernsprechabteilung (telephone detachment). The batteries of cylinders were named Flaschen-Batterien, meaning batteries of bottles or cylinders. From this the word 'Flaschen' was shortened to 'F', giving the codename F-Batteries. This was to disguise the gas cylinders from Allied military intelligence. Rather disturbingly, in view of the events which were to happen 25 years later in the gas chambers of the German Third Reich, the codename “Disinfection” was given to the chlorine gas cloud.